When we think about the development of computers, we often think into the future: we imagine (or work on developing) new software, ever larger capacities for data storage, and ever smaller, sleeker hardware design. But Ptak Science Books, a blog on the history of science with an emphasis on images, gives us an interesting look back at the products and designs that got us to where we are today. This page offers a chronological list of computers made between 1938 and 1988 (notice that more computers were made in the 1960s than in any of the decades before, as well as after!). 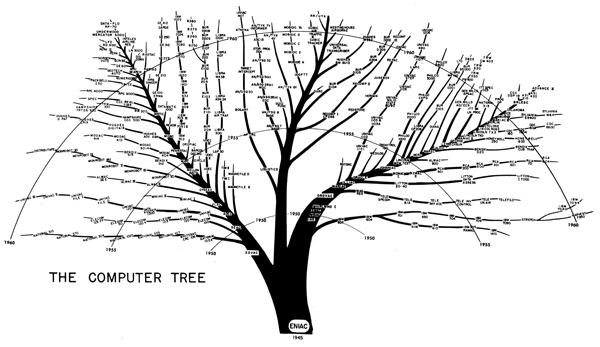 And for those of you who are interested to know exactly how the ENIAC begat the UNIVAC, and how these two behemoths are related to IBM, take a look at the expandable family tree – a naturalistic visualization of how these dinosaurs of the computer age evolved from one another.